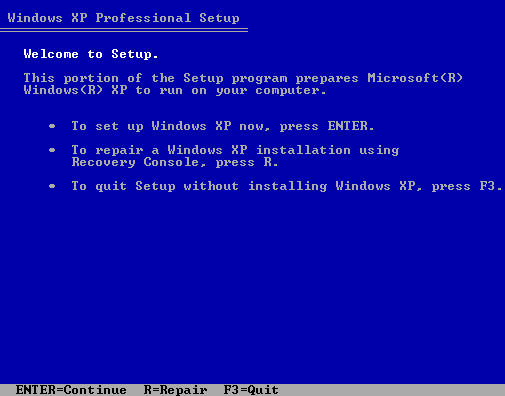 I am running Windows Xp with SP2. Suddenly, system hangs when booting. It also hangs when running last known good configuration. In safe mode, booting stops on jgogo.sys, with message “Press Esc to cancel loading sptd.sys”. First take your Windows installation CD and insert it in CD/DVD drive. You might need to change BIOS settings to make system boot from CD as first device. Boot system from CD (you will need to press any key when system asks you if you want to boot from CD). After few minutes, you will have a choice to install Windows or to Repair. Press R to start Recovery Console. When chkdsk is finished, type exit and press enter to reboot your system. Take out Windows installation CD, and let system boot normally. If system still hangs, repeat previous steps to get to Recovery Console. The fixboot command is a Recovery Console command that writes a new partition boot sector to the system partition that you specify. Type exit and press enter to reboot your system. Take out Windows installation CD, and let system boot normally. This command repairs the MBR of the boot partition. Hi I tried this but booting from the windows CD does not even get me until the Installation screen. So I can not choose recovery console either. Hello, of course this post is in fact fastidious and I hafe learned lot of things from it about blogging. get a lot of spam responses? If so how do you protect against it, any plugin or anything you can advise?